The Scrutinizer™ incident response system leverages network traffic analytics to provide active monitoring, visualization, and reporting of network and security incidents. The system quickly delivers the rich forensic data needed by IT professionals to support fast and efficient incident response. FlowPro™ is a series of products delivering enhanced network visibility, application performance metrics, and layer 7 analysis including from DNS. FlowPro applies deep packet inspection (DPI) and exports traffic and threat details to Scrutinizer for even greater context and security forensics. 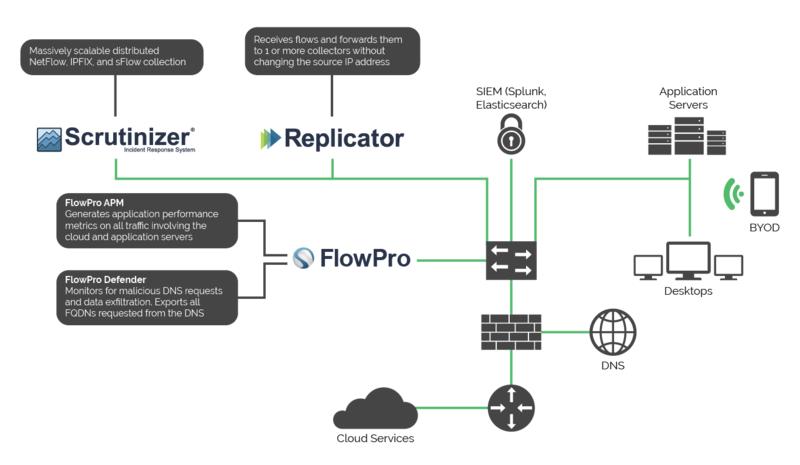 The Flow Replicator™ consumes flow and metadata exports and then replicates that data, forwarding it on to multiple systems for analysis. This reduces the CPU load of exporting devices, better leverages existing security tools, and makes it difficult for cybercriminals to cover their tracks.